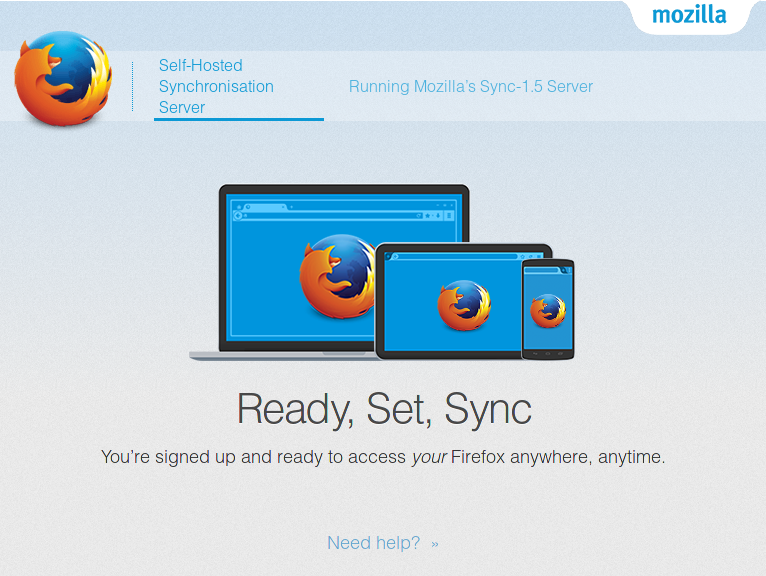 The Sync Server (ex Weaver) provides a replacement for Firefox’s default server (hosted at Mozilla). Its code is available on the Sync-1.5 Server documentation (no official documentation yet for the 1.6.x as it is really the bleeding edge version). By default, a server set up will defer authentication to the Mozilla-hosted accounts server at https://accounts.firefox.com. So you will still have to authenticate at Mozilla, but the storage of your information will be done on your host. Install it with the current url via the admin interface, or for a verbose install using sudo yunohost app install https://github.com/YunoHost-Apps/ffsync_ynh --verbose. Once installed, reaching http://domain.tld/path/ should show a page explaining how to configure it. Otherwise please refer to the Yunohost page. ./local/bin/gunicorn --reload --paste syncserver.ini instead of the classical make serve to take into account changes you will surely do by developping the app.